Tomahawk seems to be one of the most exciting new developments in the music playback world – an aggregator for all your music services, including your local library, Spotify, Grooveshark, Youtube, Last.fm and a few others I’ve not heard of. I’d never heard of it until a friend of mine, Flexstyle, pointed me to Wired’s review of the app, which is – to say the least – glowing. Also, it’s open source, which regular readers of mine will know makes me all sorts of happy all by itself. So! How does it actually work? I downloaded the app from their website and installed it, happily discovering that this much, at least, was free of any surprises or unnecessary complications. 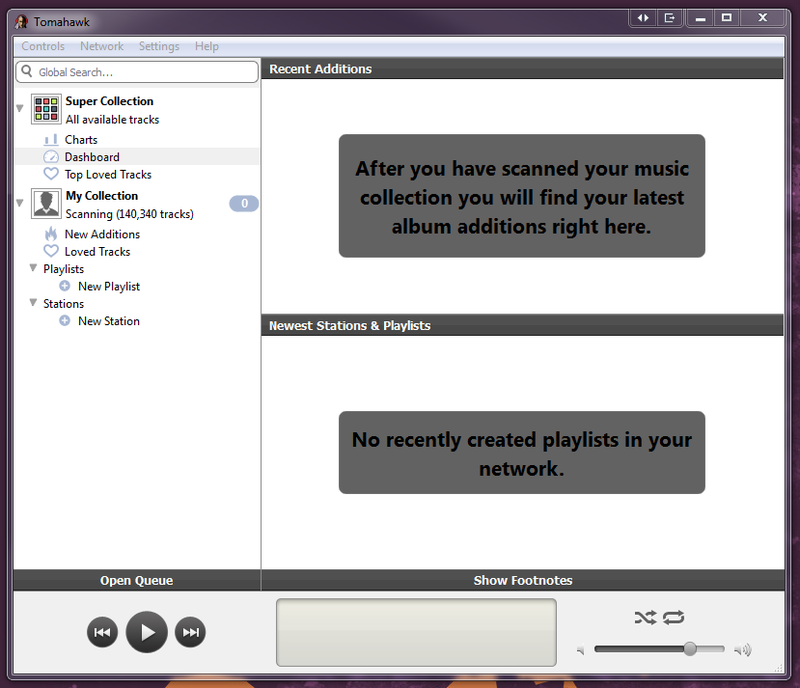 When you launch the app you are asked to choose from a list of “resolvers” and let Tomahawk know where to find the music stored locally – Windows users, your “My Music” library is selected by default. So what’s a resolver? Resolvers are the plugins used by Tomahawk to use a content service – so for instance, you would have a resolver for Youtube, another for Spotify, and another for Last.fm. You can add or remove these at will, and almost all the ones I was interested in came by default with the program, I just had to install them from the list of available choices. Notably absent was Spotify, which must be downloaded separately from their website, but that’s a hassle that takes all of 10 seconds to resolve. The resolvers for Youtube and Soundcloud both gave me the option to include or exclude covers, remixes, and live versions, which is a nice touch – but relies on whoever uploaded the file to have labeled it as such. This isn’t something I expect Tomahawk to be able to handle, but it’s something end users should keep in mind. So, I added my resolvers, signed in to Spotify (it requires a premium subscription, which I have, to function) and Last.fm, and set it to work scanning my local library. After completing the scan, the app crashed. Whoops. Fortunately, it at least had saved all my resolver and account settings, so all I needed to do was set it scanning my library again… which led to another crash. I have about 8,000 songs on my local disk right now, and it took the app only a couple minutes to scan and add them all, which was impressive, but what I found odd was that the “local collection” says it found 25,000+ tracks before it crashed, which makes me wonder if it is duplicating when coming across playlist files or something like that. I tried selecting “update collection” instead of “fully rescan collection,” and this time it counted up to 50,000+ tracks before crashing. I headed off to their support forums to see if anyone else was having the same issue, but didn’t see anything apparent, and trying to register an account didn’t work. It appears their site is moving slow – maybe Wired’s fault? – and the registration email isn’t being sent. Bugger. I’ll be skipping the local music library for now, I guess. It worked just fine with Spotify and Soundcloud immediately, though my initial searches didn’t find anything on Last.fm or Youtube, when I know there’s content at both for those searches. Youtube started getting hits when I told it to allow all versions of a song, but I couldn’t get Last.fm to give me anything. I was also hoping it would be able to import my playlists from Spotify and/or Youtube, but no such luck – this would be a great feature, though I don’t know what technical limitations might stand in the way of the developers. My biggest hesitation in moving to any new music application is the need to recreate my playlists, of which I have far too many. This could be a really cool app once the bugs get worked out, but for now, I think I’ll stick to the normal Spotify app. Hopefully I can review this again in a couple months with more success!